Time again for some wandering thoughts on the Rift and VR. 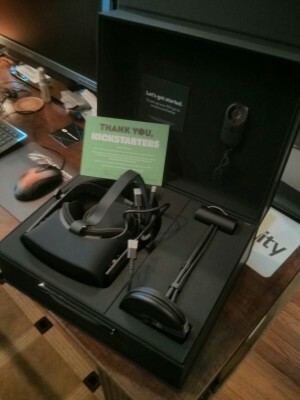 Let’s start off with some exciting news – my Rift arrived this past Monday! With all the shipping issues I wasn’t really sure when it would come. It has been almost three years since I first received the DK1 and wrote about it. What a tumultuous ride! 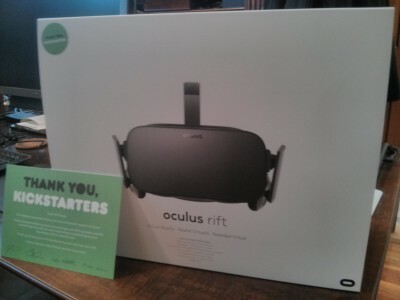 Thank you again Oculus and Palmer for doing something special like this for all the Kickstarter backers. “Rift” since I can’t call it “the Rift” anymore, has become something amazing and futuristic. I really prefer the ergonomics over the Vive and the built in audio is fantastic. If it wasn’t for the absence of motion controllers I think it would probably never have been eclipsed by the Vive like it has. Don’t peg me as an Oculus fanboy though, the Vive is also a fantastic piece of hardware as well, especially the Lighthouse tracking system. My Vive will likely be shipping soon and I plan to rotate my the desk in my office to maximize space for using it. I would say room scale VR is the coolest form of VR, however I also feel it is the most impractical since space is usually an issue. I will end up with an approximate 1 by 2 meter area to function in. I may end up moving the exercise bike out of my office to make that a little wider. It functions more as coat rack than an exercise apparatus anyway. That amount of space is more appropriate for standing VR and I have a feeling that all “room scale” games will devolve to standing in the end anyway to maximize the audience. I was really excited to try the Dreamdeck since these were such fantastic demos when we saw them at OC1. I miss the Showdown one which was hard to get running on a GTX980 and probably didn’t meet the minimum specs. There are also aspects of the Rift that really need improvement. The flares inside the lenses in high contrast scenes are not good. I feel like this can be ignored, but I keep running into content where this bothers me, and it seems to happen often. For me this is even more distracting because I wear glasses and I think that enhances whatever is going on. And speaking of glasses. I have small frames and they just barely fit. If I don’t adjust the head strap to be tight and help hold the Rift up, it will press down on my glasses on the top corners on the left and right and this will then put pressure on the nose pads which hurts. For development, the DK2 was easier to test with since the strap could be flipped up and it was possible to just hold the device against your face to do quick checks. With the Rift it requires carefully sliding it on all the way. I usually angle the headphones out so they are out of the way and shift the position of the side straps all the way out. The velcro side straps are nice, but I fear what giving public demos is going to do to them. Lastly, the software side. First let me say how incredible asynchronous time warp is. No more judder! This combined with the nice native integration into Unity has made VR development really easy. On the downside I am kind of dismayed with the new runtime. The software has gone from a simple runtime that made it more like a device that any software could utilize, to a locked down storefront. I understand this probably has to be this way, but I really wished they separated the device runtime from the store and the home environment. I also don’t like the switch that has to be thrown to allow non Oculus store application to load. I know this is like all other stores, but I just don’t like it. Another thing that is troubling is the disappearance of Share. It has been slowly removed from the Oculus website and no longer appears anywhere on there. My sincere hope is that it will be replaced with something else. All we have is the Experiences section and even that doesn’t show any of the early access stuff. Originally I thought that Share would turn into the early access section of the Store, but this seems to be the place where nearly finished content is going and there really appears to be no place to deliver experimental ideas and early prototypes. It feels like it is all heavily curated and that is disappointing. VR would not be where it is today without Share and all of the cool content that was created and made public on there. There needs to be something equivalent going forward. I am waiting and hoping Oculus has something planned. I plan to do another post on Lost Loot and my progress getting both the pre-alpha and alpha working on CV1. I will also be at SVVR again this year although it will be in an official capacity for work. I am now doing VR/AR development full time on an R&D team at Wayfair! If you see me there don’t hesitate to say hello. I hope to see many familiar faces from the “early days”. Check out the previous installment at Rift Ramblings (Part 7). Tagged cv1, oculus rift, oculus sdk, oculus share.